ExxonMobil, like the rest of Big Oil, is in the midst of a serious slump. Exxon stock is down 17% from its 2014 peak amid the crash in oil prices. The oil giant's profits have plunged to 17-year lows and its once-perfect AAA credit rating has evaporated. But Exxon, which reports quarterly results on Friday, will rebound, right? It is after all an industry titan, with vast resources and a loyal following of investors who live off its generous dividends. Tom Sanzillo, former deputy comptroller of New York State, doesn't think so. Sanzillo says Exxon's finances suggest the company may be in the middle of an "irreversible decline." "There are more red flags than a 10-car pileup at a NASCAR race," said Sanzillo, who is now director of finance at the Institute for Energy Economics and Financial Analysis, an environmentally-focused research group. Cleveland-based IEEFA is funded in part by a philanthropy run by the Rockefeller family, which built its wealth on oil but recently divorced itself from fossil fuel investments. 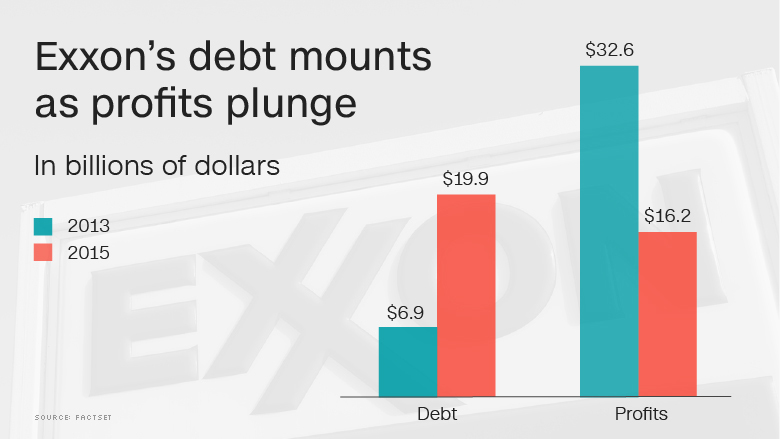 These financial pressures at Exxon are compounded by low oil prices. Crude oil is struggling to rise above $50 a barrel, or less than half its June 2014 peak. And Exxon CEO Rex Tillerson seems to believe low oil prices may be here to stay. Tillerson recently said, "It's difficult to see a big price blowout" due to the influx of U.S. shale production, according to Bloomberg. To be sure, the problem of low oil prices is one that all oil companies, not just Exxon, need to grapple with. But Exxon is more diversified than some of its peers, allowing it to rely on vast natural gas and refining operations as well. Which is why Brian Youngberg, senior energy analyst at Edward Jones, believes it's an "extreme view" to say Exxon is in irreversible decline. "Yes, debt is up, but the company operates in a cyclical business. Exxon is a long way from having any kind of financial stress," said Youngberg, who has a "hold" rating on Exxon shares. 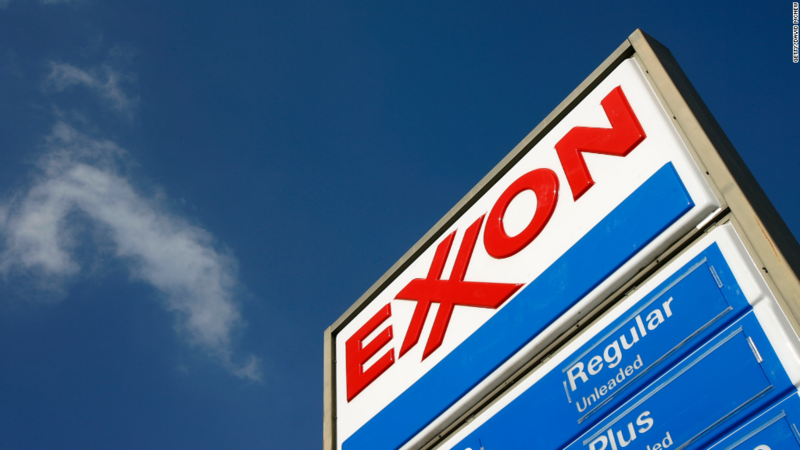 Wall Street isn't betting against Exxon either. The stock is up 21% since mid-February, thanks to oil prices doubling from their 13-year low of $26 a barrel. Exxon is also the most popular oil/energy stock on Openfolio, an app that lets users share their investment picks. Some will argue that Sanzillo and his group are only seeing what they want to see given their environmental focus. But Sanzillo said he is looking at Exxon through the "lens of an institutional investor," not as an activist. Of course, Exxon does face climate change risk too. Demand growth for oil and other fossil fuels may be challenged by efforts from major economies to limit carbon emissions. Governments have also offered more support for clean energy alternatives like solar and wind. At the same time, authorities are looking into whether ExxonMobil has been honest and transparent about these risks. Last year, the New York Attorney General launched an investigation into whether Exxon withheld information about the risks of climate change. Both the SEC and NY AG are also probing Exxon's accounting methods, focusing on whether the company should have lowered the value of its oil and gas resources given the steep decline in energy prices. Exxon has said it believes the NY AG's actions are politically motivated and that it's "confident our financial reporting meets all legal and accounting requirements." "I learned long ago that if you get caught up looking at the short term, instead of the long term, your pension fund isn't going to be worth much," said Sanzillo, who in his past role helped pick investments for a $156 billion New York State pension fund.